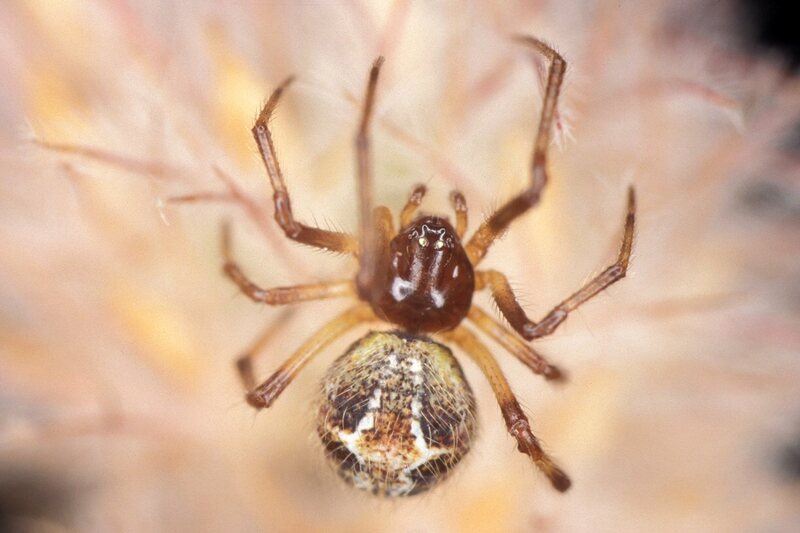 Family: Theridiidae Sundevall, 1833 (Comb-footed Spiders). Characters of family: The theridiids belong to a group of araneomorph, ecribellate spider families having 8 eyes and 3 tarsal claws. They are often referred to as comb-footed spiders because tarsus IV of most species possess a row of slightly curved serrated bristles. This comb is visible with a lens in larger species. However, this comb is often difficult to discern in smaller species and males, even under the stereomicroscope. 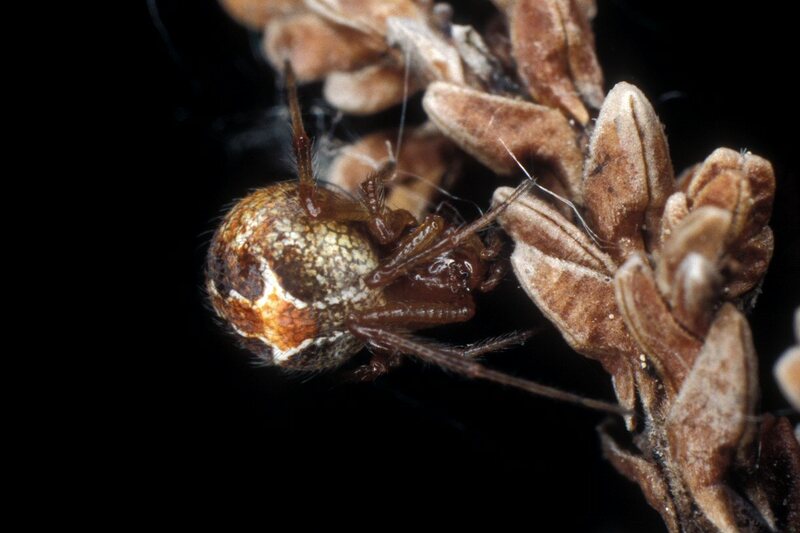 Other important diagnostic characters for the family include that the theridiids do not have the labium rebordered as opposed to the related families Araneidae, Linyphiidae, and Nesticidae. Also, they have few or no spines on their legs. Finally, the male palp is without a conspicuous paracymbium as in the Araneidae, Linyphiidae, Nesticidae, and Tetragnathidae. The carapace is very variable in shape among species, sometimes modified in males in to strange lobes not unlike those seen in the Linyphiidae. A few genera have rugose carapaces due to dense coverage of pits and warts, the latter sometimes hairy (for example Crustulina and Steatoda). In some species the carapace is almost circular and appears small relatively to the size of the abdomen. The clypeus is often very high. The sternum is triangular to shield-shaped (scutiform). It is domed in some species, for example in Theonoe minutissima. The eyes are sometimes subequal and sometimes of very different sizes. They are arranged in 2 rows of 4, the eyes of each row often equidistant. Lateral eyes are often situated close together or contiguous (for example Pholcomma and Theonoe). The secondary eyes are very often provided with a tapetum. The chelicerae are usually small and weak but some species with cheliceral apophyses may have long chelicers. Promargin with few teeth (0-3) while retromargin usually have none. The shape of endites is variable but usually they converge somewhat. The legs are moderately long to very long, lacking spines on femora, tibia, and metatarsus. The female palps possess a claw, which in the Hadrotarsinae subfamily is deeply clefted (palmate). The abdomen is very variable in shape from oval to round, sometimes globular or even higher than long. The abdomen sometimes extends over the posterior part of the carapace. In some species of the Argyrodinae subfamily the abdomen is extremely long and cylindrical. The colouration of the abdomen is also very variable as are the patterns. Some smaller species with unicoloured abdomens may resemble linyphiids. Species with sparsely haired abdomens often appear glossy. Colulus may be large and setose, small (represented just by the setae) or absent. The morphology of the colulus is often an important character in keys for theridiid genera. The tracheal spiracle is situated just in front of the spinners. Theridiids are entelegyne usually with well sclerotized epigynes. Tibia and patella of male palp are without apophyses. The palp does not have a paracymbium - just a hook on distal margin of cymbium serving as a locking device. The anterior edge of the male palpal tibia is often widened and provided with a row of long setae (e.g. in Theridion).